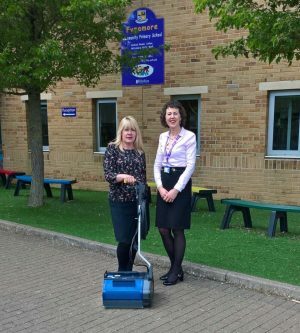 Fynamore Primary School in Calne, Wiltshire purchased their first Duplex floor cleaning machine in 2003 and finding it to be perfect for their needs went on to purchase a further two over the years with the most recent one delivered only recently to work alongside the older models which are still in use. The school’s Office Manager, Cathy Moger commented “We can thoroughly recommend the Duplex floor cleaner. We use it every day and it does a great job on our hall floor and then adapts easily to the carpeted areas with a quick and simple change of brushes. It is invaluable during the school summer clean when all the carpets are cleaned. We are excited about using the latest model with its new OPC handle feature. We found the installation and training session both useful and informative. The machines are robust and very durable and we like the fact that parts can be replaced keeping the machines up and running in good condition for many years”.